Hamish McRae of the Independent has come up with a Brilliant idea, all by himself, which will save the Bexit, Britain, the Planet, the Universe and Everything. This Brilliant idea is that there is an off-the-shelf solution in the European Economic Area, "the Norway relationship", says The Brilliant Hamish. But the really Brilliant idea that we can use this as an "interim deal" which "will change as little as possible". "We leave the EU", he says," as required by the referendum, but follow most of its rules and pitch into its coffers. It is not ideal, as Norway acknowledges, and there is one big sticking point: freedom of movement of people. But you could envisage a modified version of that, with some restriction of movement for jobs, being saleable to both sides". Now think longer term, Hamish tells us. "Assume we are members of a slightly modified EEA. We use the next few years to refocus our trading links towards the rest of the world. It is happening anyway; it just happens a bit faster". Then, he says, "because EEA membership was always a transitional arrangement, we renegotiate it to enable us to have free trade deals with the US, which is already our largest export market, though smaller than the EU as a whole". Sadly, though, Hamish is too late for the Nobel Peace Prize to celebrate his brilliance. According to Ambrose Evans Pritchard, he got there first. "Like others", he says in his latest column, "I have floated the Norwegian option as a half-way house for five to ten years". One has to acknowledge that this truly is Brilliance. For sure, the "Norwegian option" has been around forever. We saw a reference to it in The Economist on 7 October 2004, where a particular enthusiast was Peter Hitchens who, on a recent pilgrimage to Oslo, discovered a "real nation which controls its own destiny". Strangely enough, though, if you search the unforgiving internet from 2007, the earliest point from which Ambrose dates the "floating" of his Brilliant Idea, it is strangely hard to find any reference to it. On 15 December 2011 we get Reuters columnist, Martin Hutchinson, offer in the pages of The Daily Telegraph, the idea that we should leave the EU and join the European Economic Area. The EEA was established in 1992, he says, describing it as "a sort of half-way house between full membership in what was then called the European Community and total autonomy". The challenge, Hutchinson warned, would be to make the transition to the EEA amicable. But, he said, it is worth making an effort to keep the benefits of the EU's large market while minimising costs, friction and bureaucratic meddling. Quietly and non-confrontationally, the EEA should be Britain's goal. But as for Ambrose's Brilliant insight, if he was floating it around 2011 or before, it was so totally invisible that it must have been a submarine. Furthermore, search as one might, this "submarine" seems to have remained invisible for many years thereafter. Although in 2014, I formally launched Flexcit on the waiting world, in which I – with the assistance of the readers of EUReferendum.com - suggested the adoption of the "Norway Option" as an "interim solution", Ambrose must already have been years ahead of us. Owen Paterson, the former environment minister who might lead the Leave campaign, says that if Britain joins Norway in the European Economic Area, Britain would be "perfectly at liberty to pursue participation in the single market without being saddled with the EU as a political project". Since Norway does not abide by the EU’s agriculture, fisheries, regional or foreign policies, Daniel Hannan thinks it is "not a bad deal". Nevertheless, it took another year for Ambrose's "submarine" to surface and become publicly visible for the first time. This was on 2 June 2016, when he had published a piece headed: "Leave camp must accept that Norway model is the only safe way to exit EU". If Brexiteers wish to win over the cautious middle of British politics, he wrote, they must make a better case that our trade is safe. This, he added, "means accepting the Norwegian option of the European Economic Area (EEA) - a 'soft exit' - as a half-way house until the new order is established". Further down, he then made a specific reference to "two excellent reports on the EEA option", one the plagiarism of my work by the Adam Smith Institute and the other "entitled 'Flexcit' by Richard North from the EU Referendum blog". The Leave campaign has offered no convincing plan for our future trading ties or the viability of the City. It has ruled out a fall-back to the European Economic Area, the "Norwegian" model that would preserve - if secured - access to the EU customs union and preserve the "passporting" rights of the City. The EEA would be a temporary haven while we sorted out our global trading ties, the first step of a gradual extraction. The Leavers have not embraced this safe exit - or rather, less dangerous exit - because it would mean abandoning all else that they have pledged so promiscuously, chiefly the instant control of EU migrant flows. By this fourberie they have muddied the water, conflating constitutional issues and with the politics of immigration. We risk a Parliamentary crisis and shrieks of betrayal if the Commons - discerning the national will - imposes the EEA option on a post-Brexit government, as it may have to do. It doesn't seem here as if there are many others who support this "temporary haven" idea, and there is no mention of Flexcit. But never mind. Ambrose's "submarine" is powering ahead in full sight. Nine days later, on 22 June 2016, he writes under the heading of, "UK and Europe face Mutual Assured Destruction if they botch Brexit". And again he is telling us that: "My preference is the European Economic Area, the Norwegian option". After keeping his Brilliant Idea submerged for all these years, Ambrose makes up for lost time, asserting that it is "a temporary way-station to retain unfettered access to the EU market and 'passporting' rights for the City". It is, he adds, "a withdrawal in safe stages, with all the compromises that this entails". This, entirely coincidentally, exactly matches the Flexcit proposal of a phased exit. Then, only days later, on 24 June 2016 - a day after the referendum – he tells us that the pro-Remain group TheCityUK already has a plan to limit the damage, insisting that the City can prosper outside the EU. They want, he says, unfettered access to the EU single market and passporting rights for the City, and this means either pushing for the Norway option of the European Economic Area (EEA), or a hybrid variant. But, Ambrose says, "this safe-exit is a compromise, and an olive-branch to the EU since we would continue paying into the EU budget and accepting the EU Acquis. It would last until we have negotiated our bilateral trade deals with the rest of the world". Oddly enough, the reference to TheCityUK and the Norway option was repeated by Reuters on the 27 June 2016, except there was no reference to an interim or temporary option. However, the day before, EU Law Analysis has stated that, "the EEA could be used as a purely interim measure while negotiating a longer-term arrangement, which could take the form of amendments to the EEA itself". By now, of course, the idea is gathering a head of steam. 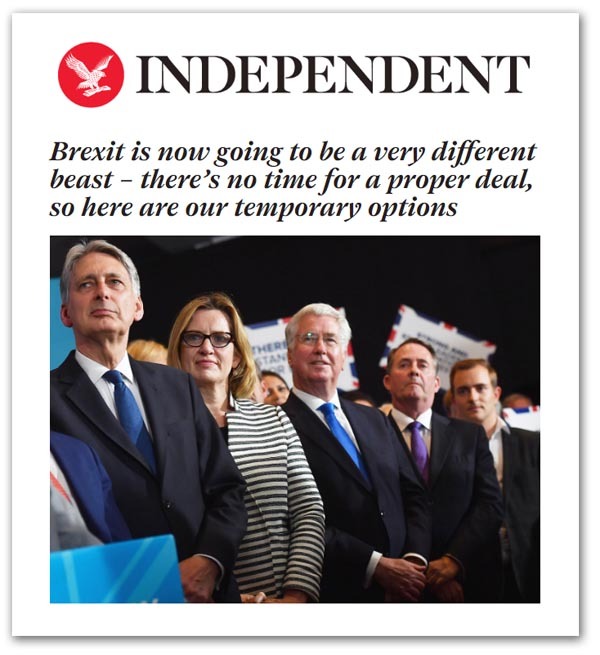 Last Saturday, Liberal-Democrat Voice was taking the view that, "it is becoming more and more crazy that this country has not, at least as an interim “holding” solution, gone for the Norway (EEA/EFTA) option". So, where does this take us? Prior to 2014, we can find no reference to the Efta/EEA option (in any guise, including as the Norway option), specifically or in any way discussed as an interim, transitional or temporary solution. Post 2014, there are multiple references to the "interim solution", but mostly related to Flexcit in some way or another. The first time I can find to Ambrose referring to the Norway Option in that context is on 2 June 2016, alongside his reference to Flexcit. And that is after I've had several discussions with him over the telephone, and sent him a copy of the work. But then, on 10 June 2017, Ambrose re-appears to promote the EEA (the Norwegian option) as a "natural fit", attributing it to Lord (David) Owen, "one-time Labour foreign secretary and doyen of the EEA camp". He says: "We should use the EEA as a vehicle to lengthen the transition time". And now Ambrose tells us: "Like others, I have floated the Norwegian option as a half-way house for five to ten years". That's the way it's going to play out. That's the way we do business in this country. Despite my beating the drum for years for the EEA as an interim option, and being largely ignored, the legacy media have now "discovered" it all by themselves. They are now in the process of owning it, with Ambrose in the vanguard. In a few weeks, they will have re-written history and Efta/EEA as an interim option will be their unique property. Give it a few more weeks and the interest will either have subsided or it will have been "reinvented" by the politicians, whose "brilliance" will be applauded by fawning Tory Boys in Conservative Home, or somewhere elese in the system. Flexcit, the spectre at the feast, will remain invisible.